Just 35€, for up to 4 passengers with bags! Welcome Pickups provide a personal rental service with chauffeur-driven sedan cars with English-speaking drivers for door-to-door transport of passengers within the Madrid metropolitan area and from Madrid airport, in Barajas. Welcome Pickups pick up the customer where he or she has specified in the reservation, and the driver will be holding a Welcome Sign with your name on it, and will definitely make sure you are picked up on time. In case of big delays or cancelled flights, we will make sure another driver is assigned to you. 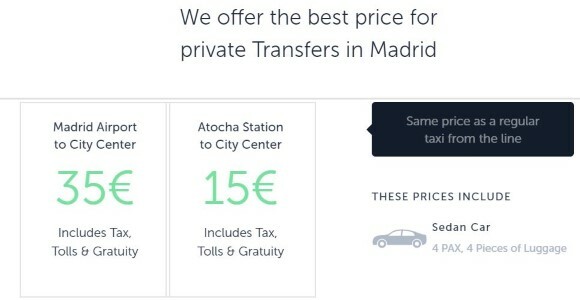 This is therefore the most efficient way of getting from Adolfo Suárez Madrid–Barajas Airport to the city centre - a truly economical Madrid airport transfer. This transfer service operates 24 hours a day, every day of the year, including holidays and weekends. Reservations are accepted online 24 hours a day. The Welcome Pickups service represents the easiest and most economic way of moving from door to door between your hotel or home and the Airport of Madrid, Barajas. The fleet of vehicles is primarily made up of quality sedan cars with seating for up to four passengers, plus seating for the driver. The option of transfers for larger groups is also possible. The cars are equipped with air-conditioning and an internal communication system to offer fast and flexible service. Ample space in the back provides comfortable transport of luggage inside the vehicle, never on racks mounted on top of the vehicle. When making a booking you will be asked to indicate your flight number (usually in the form of AB 123). In that way your driver will be aware of any flight delays or cancellations and will be at the airport, on time, waiting for you with a sign having your name on. Should you land and see that you might take more than an hour to exit the airport, we suggest you either contact our Customer Support or your driver. However, we know it takes time to exit the airport so we've included 60 minutes of complimentary waiting time. Our drivers also track flights so they are notified about delays. Your complimentary waiting time starts the moment your flight lands. Your driver will wait for you at the arrivals gate. If you believe that it will take you more than an hour to exit the airport, feel free to adjust your pickup time, when making a booking, by clicking on the Edit button. After booking, you will receive all details by email. Then, 4 days before your trip, we will send you the driver's details (name, photo and contact details, and a reminder with instructions for the meeting point. Upon making a booking you will be asked to indicate the number of children riding with you. Children, aside from infants, count as individual passengers. Feel free to indicate, on the comments' section, whether you would like a children's seat. Please also mention their age. We offer baby and booster seats at no additional cost. NOTE: Prices are are quoted in euros and include VAT. Fees are charged online via a secure server. Please note that these are total prices and not per passenger (for example, 4 passengers from the airport would be less than 9 euros each!). You can click the button below to see the airport transfer prices. AresMobile also offers chauffeur-driven limousines - the Mobile service. And we highly recommend these other Private Airport Transfers in Spain if you are arriving at the airports of Barcelona, Valencia, Granada, Malaga or others - just click the previous link! Or click the next link if you are going to Greece and need an Airport Transfer in Greece, including Athens, Crete, Rhodes, and many more.